Vegan gossip & tips in the beautiful cowtown of Kansas City. Proof! 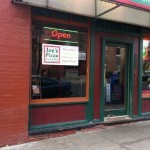 Joe’s Pizza Buy the Slice on Pennsylvania carries Daiya. They will happily (the vegan employee who pushed for it took our order and cheered!) hook you up with a yummy vegan pizza and/or their cheese-covered bread sticks. Daiya at Joe’s Buy the Slice! 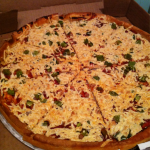 This Westport institution announced this week that it is now offering the ever-popular Daiya on its 14” pizzas. Maybe we’ll luck out and be able to get it by the slice soon?